I want to show vegetable cutlet and to keep it as a vegetarian dish I have not used egg. But if you want to dip in egg and roll on bread crumb, you can do it. I use cauliflower, broccoli, bean and corn here. 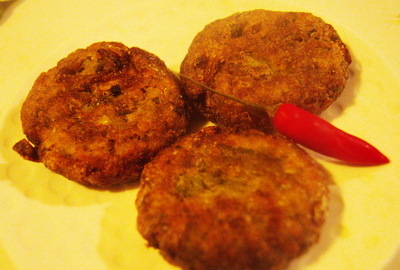 Habanero chilli (bombai morich) can be used it this cutlet. 1. Boil diced potato and vegetables in microwave separately. For microwave boiling you dont need water. Just place into microwave proof bowl , close the lid loosely and put into microwave. If you are boiling in water, you need to drain water straight away and place into strain to get rid of any excess water. 2. Fry sliced onion till it becomes gold brown and mix fried onion, chopped chilli, boiled potato, vegetables and salt. 3. Mix well and make 10-12 flat balls. 4. Roll them in cornflour. 5. Heat the pan with oil on medium high and when oil is ready, fry vegetables cutlets till these become golden brown. 6. Serve vegetable cutlet/ sobjir cutlet with or without sauce. You can also have vegetable cutlet with polau. Tips: If you are using water to boil, I will recommend to add egg when you are mixing boiled vegetables. 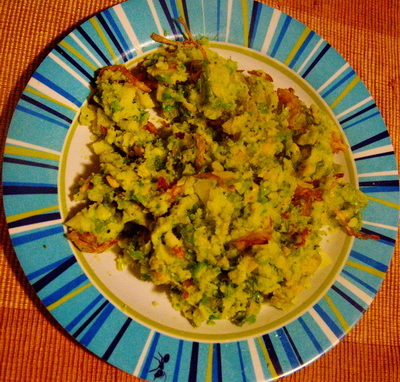 dont add too much egg , add little by little to keep it pliable. If you make to soft , you will not able to give shape.